The Pickin' Chicks are a group of four girls, Nikki, Paige, Mallory and Chris. They are from three different families in Illinois. Nikki and Mallory are sisters, but other than that, the four girls are not related to each other. They meet each week at The Bluegrass Shack to practice under the direction of Chris Talley Armstrong, who is the band's bass player and manager. All four girls can sing lead, tenor and baritone, and all four girls play more than one instrument. Nikki (banjo) is 13 years old, Paige (fiddle) is 14 years old, and Mallory (guitar) is 15 years old. We're not saying how old Chris is! 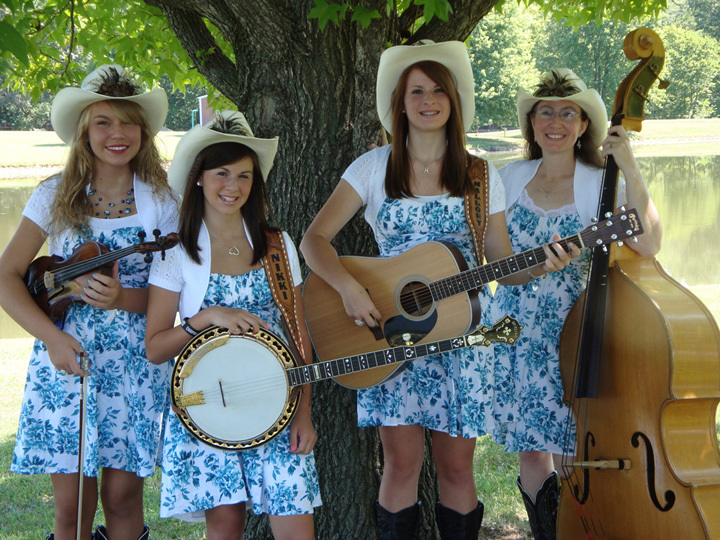 Though young and relatively new to the music scene, the Pickin' Chicks have been setting the bluegrass world on fire! In a little more than two years' time, they have managed to record their first CD, played at Silver Dollar City's 2011 Bluegrass & BBQ Festival, opened Friday night for the 2011 Willie Nelson Country Music Throwdown, and won the 2011 Illinois State Best Vocal Group Competition at the Illinois State Fair in Springfield, IL. The girls got to meet Steve Martin one-on-one, and banjo player Nikki was even asked to play for Steve!